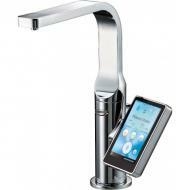 Sleek stainless steel faucet plus LCD touch screen is all you see above your countertop. Chanson plates are medical grade platinum coated titanium made with a fritting technology that involves repeatedly baking on layers of platinum at extremely high temperatures. This process results in long-lasting electrodes composed of a thick, stable coating of platinum with outstanding electrical conductivity. Make specialty waters of extremely high or low pH (for external use only) by adding Himalayan rock salt to the salt port. External valve makes it easy to control the speed of flow of your ionized water. 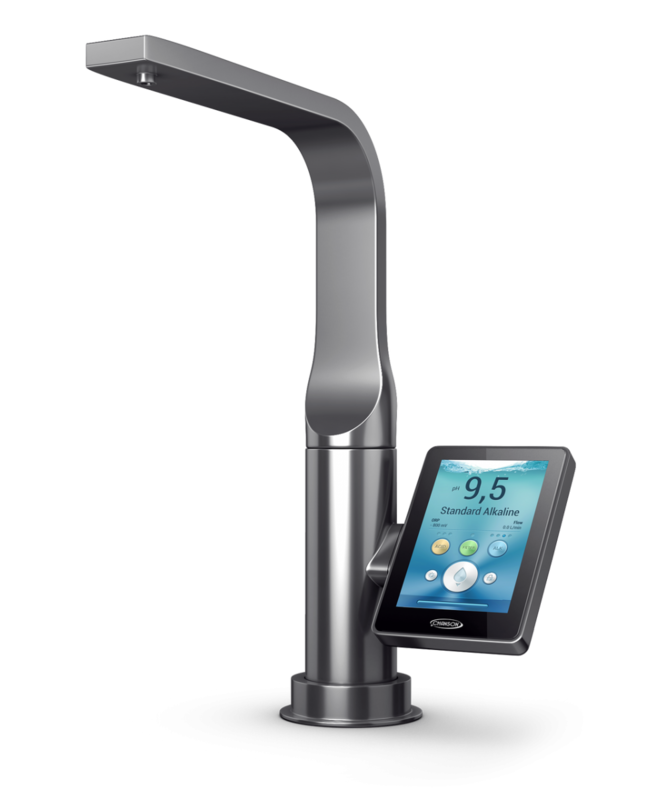 Select the type of water you want your Royale ionizer to produce using the 3.5” touch screen. The Royale ionizer contains a filter called the PJ6000 (which is not the same as the recommended external prefilter). The touchscreen display shows the approximate remaining service life of the PJ6000 filter alerting you to change your filter when necessary. 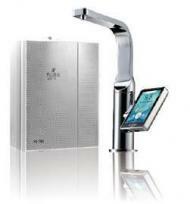 The Royale ionizer will automatically flush standing water each time you turn it on. Self-cleaning will be initiated automatically at intervals suited to the mineral content of your local water supply. These cleaning cycles will occur after you turn off the ionizer so that performance is maintained without interrupting your use of the machine. Chanson Royale shuts off automatically after 20 minutes in case it is left on by accident. The machine can be on turned on again immediately if desired. Easy installation with quick connect fittings. *Note Ionizer performance (pH and ORP levels) will vary depending on source water conditions. This is true of any water ionizer. 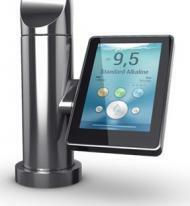 Faucet Display: 3.5” LCD touch screen. Faucet Installation: Requires 1” to 1½” (35 – 38mm) hole through your sink or countertop. Installs under your sink on the floor or wall of your under counter cabinet. Ionizer (under counter) connects to ionizer faucet (countertop). Chanson ROYALE ionizer also requires connections to electrical outlet, cold water supply line and sink drain. All ionizers produce two streams of water simultaneously – the selected water (usually alkaline) and reject water (usually acidic). With the Chanson ROYALE ionizer, the water you SELECT flows out from the stainless steel faucet into your sink. REJECT water goes directly to the drain under your sink by way of a special drain connection which comes with the ionizer. A check valve is also provided to prevent back flow. Chanson ionizers incorporate an innovative onboard filter that is made of activated carbon wet-molded with fibre, the PJ6000. This special formulation has 20 times more volume, 150 times more area and 10 times more speed of absorption than regular activated carbon. The filter is silver-impregnated to add anti-bacterial properties. Nevertheless, it is important to note that no single filter of the type used onboard ionizers (of any brand) can comprehensively address all water contaminant issues. Water ionizers are not water filters. We highly recommend filtering water before it enters any brand of water ionizer. Effective water filtration must be tailored to local water conditions. Although all ionizers have on-board water filters, these cartridges simply do not have the capacity to intercept the broad range of contaminants inherent in most water being supplied to homes today. Each water district or water source has distinct characteristics which may or may not include chlorine, chloramines, fluoride, pesticides, herbicides, pharmaceuticals, industrial contaminants, arsenic, etc. The micro-clustering properties of ionizers make pre-filtration all the more important. Ionized water may penetrate deeply into the tissues of the body. 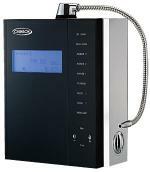 The water entering an ionizer should be as contaminant-free as possible.